Housemade wonton crisps, seared togarashi spiced sushi grade ahi tuna, fresh ginger, heirloom tomato relish, avocado, pickled red onions, daikon micro-greens with an avocado wasabi aioli. Just like a cheeseburger, but in an egg roll ... served w/ 5280 dipping sauce. Hand battered fried chicken tenders with choice of sauce. Hand battered kosher dill pickle chips... served w/ our house-made ranch dressing. House-made & served with stone ground mustard. Deliciously fresh wings tossed in any of our three sauces: honey siracha, Thai style or buffalo. Grilled fresh jalapeños stuffed with house-made pimento cheese... Wrapped in bacon and topped w/ pico de gallo. Just what it says, queso & fries.. Oh, and topped w/ pico de gallo. Slow roasted pulled pork, pickled onions, cabbage & cilantro aioli served on corn tortillas. Green chili queso, house-made guacamole & roasted red pepper hummus served with fresh made tortilla chips or veggies. Kale, cabbage, shaved Brussel sprouts, arugula, roasted pepitas and sunflower seeds served with a housemade orange ginger vinaigrette. Kale, arugula, toasted pepitas, pickled red onions, avocado & organic alamosa quinoa tossed in a cumin vinaigrette. Roasted corn, mixed greens, cilantro, red pepper, poblano pepper, avocado, housemade pico de gallo served with a smokey chipotle dressing. Spring mix, strawberries, goat cheese, candied walnuts & champagne vinaigrette. Angus beef or chicken, romaine spring mix, roasted corn, black beans, avocado, pico de gallo & cotija cheese... Tossed in our jalapeño agave vinaigrette served in a tortilla bowl. Chopped romaine hearts, parmesan cheese & housemade pretzel croutons tossed in traditional Caesar. Romaine lettuce, feta cheese, cucumber, grape tomatoes, kalamata olives, red onion, cherry peppers & a housemade Greek dressing. 100% black Angus beef, pecan wood smoked bacon, guacamole, white cheddar cheese, red leaf lettuce & roasted garlic aioli. Angus beef*, sauteed seasonal mushrooms, swiss cheese, red leaf lettuce & garlic aioli. Angus beef*, gruyère cheese, bacon onion jam, pickled red onions, shredded red leaf lettuce & roasted garlic aioli. 100% black Angus beef, pepper jack cheese, hatch green chili, roasted poblano pepper & crispy tortilla strips. Angus beef, jalapeño cream cheese, red leaf lettuce, roasted red peppers, fried onion straws & pecan smoked bacon. Angus beef, cheddar cheese, slow roasted pulled pork, pecan smoked bacon & bbq sauce. Angus beef, jack cheese, sautéed habanero & serrano peppers, red leaf lettuce, 5280 chipotle mayo & our famous ring of fire sauce order this - your 2nd beer is half off! Angus beef, pepper jack cheese, grilled seasonal chili peppers, caramelized onions & 5280 chipotle mayo. Pick any two of our signature burgers jumbo slider style. 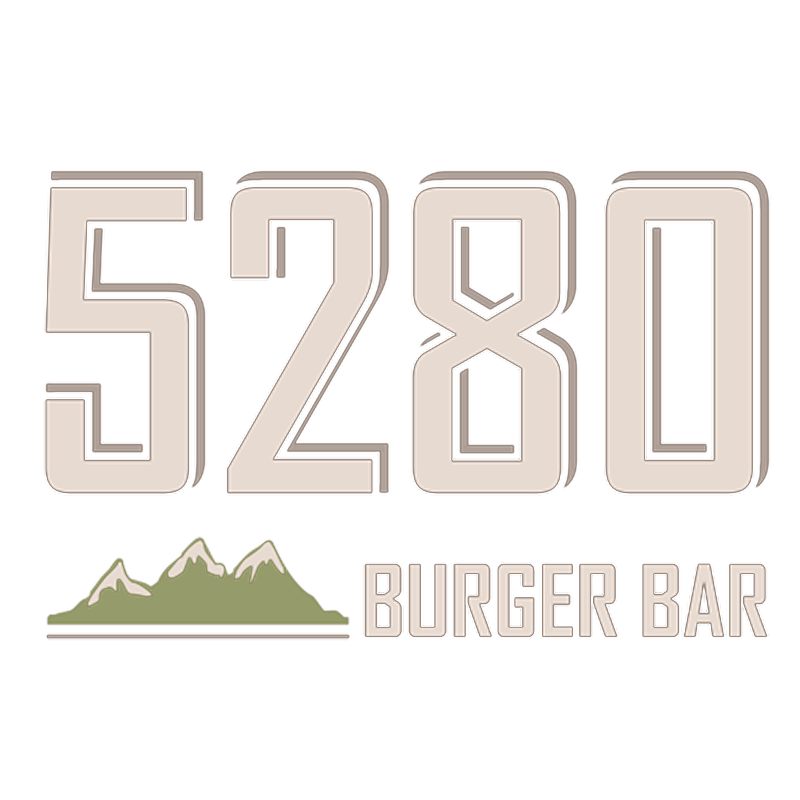 Colorado raised “7x” prime wagyu beef*, sharp white cheddar, onion rings & 5280 steak sauce. 100% black Angus beef or grilled chicken, grilled pineapple, lettuce, tomato & citrus aioli. Colorado raised lamb*, butter lettuce, marinated cucumbers, feta cheese & a calabrian chili aioli. Goat cheese, roasted red pepper hummus, caramelized onions, arugula, tomato & 5280 secret sauce. Sushi grade ahi tuna*, arugula, pickled ginger, avocado & wasabi aioli. We spent a lot of time thinking about this stuff but if you know better we’ll make it your way!! Coffee and sea salted caramel ice cream, coffee liqueur and Irish cream. Toasted marshmallow ice cream, shaved dark chocolate, graham cracker crumbs, vodka and a toasted marshmallow. Toasted coconut ice cream, pineapple preserves, fresh pineapple and coconut rum. Mint chocolate chip ice cream, créme de menthe and chocolate vodka. Caramelized banana ice cream, marshmallow fluff, creme de banana, 99 bananas 99 proof banana schnapps and nilla wafers. Chocolate and caramelized banana ice cream, 99 bananas 99 proof banana schnapps. Sea salted caramel ice cream, rocky mountain rootbeer and Irish whiskey. We serve premium Colorado handcrafted beers. Check out our blackboard for the latest and greatest brews…we rotate them frequently! We offer the finest small batch, handcrafted liquor available, including all the old favorites for drinks, mixed and muddled to perfection. Enjoy the traditional ones or some of our new signature takes. Mexican vanilla ice cream, hot fudge, caramel & pecans. Strawberry ice cream, sweet strawberries & whipped cream. Salted caramel ice cream, fudge, almonds & whipped cream. Our in-house Ice Cream Chef constantly experiments with new flavors, some a little out there and some simply outrageous! Every day, check out our board for our latest additional eight Something Special Flavors. One is guaranteed to be your new favorite!